Kenton 5-pc. Dining Set The best part about this Kenton 5-piece dining set may be its ability to mix and match styles so well! Its dark walnut and ebony finishes serve up a casual two-toned look, plus its smaller scaling makes it a smart choice for an eat-in kitchen or breakfast nook. But this dining set also features more formal design elements, like a gorgeous pedestal table base and keyhole chair backs. And if you're space conscious, you'll appreciate the table's self-storing butterfly leafit provides extra table space when you need it and can easily be stowed out of sight when you don't! The best part about this Kenton 5-piece dining set may be its ability to mix and match styles so well! Its dark walnut and ebony finishes serve up a casual two-toned look, plus its smaller scaling makes it a smart choice for an eat-in kitchen or breakfast nook. But this dining set also features more formal design elements, like a gorgeous pedestal table base and keyhole chair backs. And if you're space conscious, you'll appreciate the table's self-storing butterfly leafit provides extra table space when you need it and can easily be stowed out of sight when you don't! Kitchen set SCORED ! ! ! This is a great set. It fits in my kitchen perfectly. I am also in love with the expendable board being attached to the set and just with a open and flip the table has the board in it. There is no searching for where did I hide the board. My niece has the same set and thats when I fell in love. The delivery men were great and on time. The whole experience was a positive. Bought the Kenton dining set. Beautiful, solid perfect size for smaller dining area. Sturdy chairs with nice high back. I have not used them long enough yet, but seems like a long dinner would be quite comfy. Chairs fit better with leaf open. With leaf closed, the chairs have to stick out a bit because the chair legs hit each other.......I like to push my chairs in. This dining room set is a beautiful piece of furniture. It looks very elegant. I really love that the leaf is hidden within the table. It makes storage so convenient. The colors make it look rich. The server matches so well with it.I love it! Our kitchen is pretty small but we have room for a table. We bought this to replace a high-top table w/ stools set. This is perfect! The chairs are much more comfortable than a backless stool and the table is a perfect size for two. What's even better is the leaf stays in the table so when we have a few guests we can open it up and don't have to worry about storing it. It's a pedestal which is even better for adding a couple extra folding chairs around it if need be. I will say, the wooden back isn't the MOST comfortable if you're leaning back against it but the set itself makes up for that. The two-toned wood goes great in our kitchen too because we have light cabinets and floors but the furniture throughout the rest of our open plan house is dark. I would definitely recommend this if you're looking for a great table for a small space. 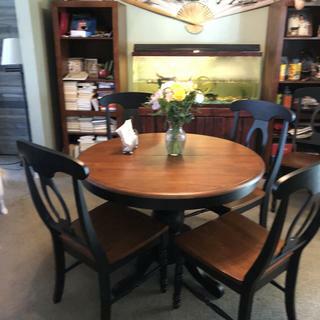 This table and 4 chair set is a beautiful replacement to our kitchen. The quality is high and the furniture is solid. We expect to have it forever. There is a little reddish color coming thru the black, but that's what gives it character! Chairs are comfortable even without cushions. There is a little too much gap where the table comes apart for my liking - but that just means I have to watch the crumbs. Overall, very pleased with the table and chairs. Bought about a month ago. Very high quality. Love the set. Solid high quality dining set. Fits perfectly in my smaller sized dining area. Adding the matching server makes the room look and feel very inviting and comfortable. The hidden leaf storage is a bonus. We love this set. It seems quite sturdy and we like that we don't have to store the leaf under the livingroom sofa. There weren't any care instructions that came with the set, but the delivery man that put it together said to only use a damp soft cloth (water only) to clean it. Never use a polish because over time it will eat away at the finish. Wish there had been something about this in the Kenton flyer that I was given at the store. Other than that, we love the set and expect to have it a long time. Love this table. Very sturdy and very good looking. Great price as well. Was deciding on 2 different sets. Glad we bought this one. Love the color of the table top. The black chairs accent the table perfectly. Fits perfect in our kitchen. Very happy with this purchase. Raymore & Flanigan have quality furniture. This will last a long time.. Would recommend them to everyone. MY HUSBAND AND I ABSOLUTLY LOVE THIS DINING SET. THE QUALITY OF THE WODD IS BEAUTIFUL. THE BUTTERFLY LEAF IS SO EASY TO USE AND OPENS THE TABLE UP INTO A NICE OVAL SIZE. THE CHAIRS A VERY WELL MADE AND LOOK EXCELLENT WITH THE TABLE.. WE WILL USE THE TABLE AT IT'S SMALLER SIZE BEING 42 INCH ROUND AND LOOKS WONDERFUL WITH OUR DECOR. WE WOULD HIGHLY RECOMMENT AND WOULD GIVE THIS SET A 10 STAR. You will never find a bad review for this table. All the reviews will be positive. The table can expand and contract with built in leaves that hide inside the bottom of the table when the table is closed. the table can be round or expanded to a larger rectangular shape. The table is attractive and comes with 4 beautiful chairs. The table can be raised or lowered. There we have the only negative. The table has to be disassembled to raise or lower height. An 8 inch circular wooden tube with four 6 inch extended bolts are supplied to change the height. Only 2 heights are available. Chair height or stool height. Stools are not part of the set. You do get a lot for your money. We are very pleased with our dining set. We will be returning to purchase additional items as needed. Thank you. First time buying furniture here, recommended by a friend. This dining set looks much more expensive and more formal than other dining sets I had bought in the past. Excellent quality and price. I have gotten so many compliments. and don't have much room but wanted something with a leaf to have family members for the holidays. This set just fits my needs and I don't have to worry about finding storage for the leaf. The only negative thing I could say is that the sales rep should have demonstrated how to open and close the butterfly leaf. I had kind of a struggle when I first tried it. It was a little tricky. otherwise, no complaints. We love the new Kenton breakfast set. It is perfect for the spot in our kitchen! Very sturdy, well built & attractive! The sales and delivery crew experience could not have gone better! We highly recommend this product and Raymour & Flanagan! 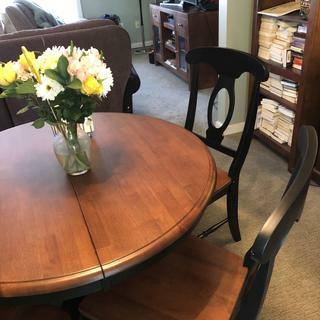 I have downsized from a long table with 2 leaves and 6 chairs to this set which is just what I wanted - I do like the butterfly leaf in the middle to make the table large This is the set which will clean up easily and even my 2 cats like it! This set works perfectly in our kitchen. The hidden butterfly leaf is perfect too! And the fact that it can convert into counter height in just a few short minutes is even better. So glad we bought it! Thanks Raymour and Flanigan!! The table and chairs are the perfect color and style. I hike that table expands. It's easy to operate. The close size is perfect for where I have it placed. I am delighted I bought this set. The price was very competitive. The guys who delivered and set it up were excelllent. Memphis and his crew were on time, polite, professional and funny. Perfect for a smaller kitchen! We purchased this set for our eat in kitchen. Love the fold in leaf for extending the table when needed. The chairs are sturdy, comfortable and great to look at! I am very happy with this dining set. It fits beautifully in my kitchen area. 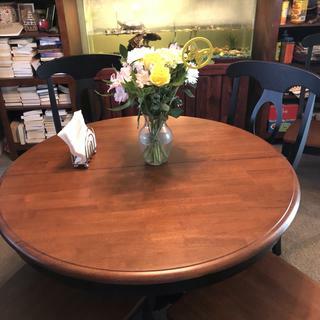 On the day of delivery we discovered there was a problem with the leaf (a piece of wood was missing and the leaf was hanging down underneath the table) but the customer service was excellent and the problem was resolved right away. I would definitely recommend Raymour & Flanigan. Absolutely satisfied with my purchase of this table with leaf and my six chairs. I Love this dinning set. It is sturdy and fits small places, but it also has a hidden leaf that allows more people to be seated or more food displayed when you have company. it has a elegant appearance and i fell it will last a long time. Shopping experience was great. Salesman knowledgeable and very helpful. Helped find the best sale price available. Delivery on time. Very nice dining set. Excellent quality and the leaf is self storing which is a nice feature. This dining room set is perfect for our kitchen. The two tone colors are beautiful. The table and chairs are sturdy and the size of the table with the leaf in is just right for the size of our kitchen for my husband and I. Moving from a 4 bedroom home to a very small apartment has been a challenge. Not so with going to Raymour and Flanigan! The dining set was perfect and just the right size. The chairs are comfortable and just having the option of opening up the table with the leaves underneath --- an added bonus. After 2 years of searching for a round table with a trundle leaf, I found the Kenton 5 piece dining set at Raymour & Flanigan. This table is extremely well made with trundle leaf and the table opens and closes with a gear mechanism. The chairs are well built as well. Previously other tables I looked at like this were 3 times what I paid for it. An exceptional value for the price. We are so happy with our pedestal table and chairs. The wood and black colors blend with the wood in our new home. The butterfly leaf is such an improvement from the separate leaf on my previous table. No struggle with separating the table or having to carry and lift a leaf into place. My daughter and I sat at the table and then easily opened the leaf. So glad I purchased this 5-pc. dining set at Raymour & Flanigan. Table is nice. Delivery was good. So far so good! I love my new dining set and it looks beautiful on our new hardwood floors. I will be back. Thank you to the two sales people that helped with my selection. I love it! It’s small without the leaf, but with the leaf it’s still small but looks more expensive. I love how there are screws on the bottom to resolve any wobbling. It looks great in my home! We downsized and was looking for a small dinette set, this hit the nail on the head ! This is the perfect size and if we have company the fold out leaf is perfect. Love that is all wood and maple top is beautiful !! Would definitely recommend this table and delivery as promised and the men were top notch! ! This set looks and fits perfect in my dining room. The sales rep was very patience with me and attentive to what I was looking for. The delivery guy came back on his own time because there was a piece missing to put the table together and to bring back new chairs that were not to my liking. We picked out the table and chairs in real life in the store, not from a catalog. We purchased this along with the Colebrook 2 piece server and it works perfectly in our kitchen/dining space. It's very sturdy and looks beautiful! Very pleased! Table and chairs are sturdy and look great in our house. Fits in the room perfectly. Delivery was quick. Perfect dining set for a kitchen. Love this dining set! Matches perfectly with my kitchen cabinets. I love the fact that it has a leaf that stores inside the table itself. Style of the set is so beautiful. I love the Dining Set and matching Server, great quality at a reasonable price. Absolutely Beautiful!! I bought this set for my kitchen and it fits perfectly. What I liked about this dining set is that the table is a very smooth wood and the leaf is built into the table. The customer service representative had patience as I am totally blind and I had to feel each set, since I could not see them. Love it!! After having a TERRIBLE experience with an online company, we went to Raymour & Flanigan were everyone was super helpful, and didn't make buying furniture feel like you were in a used car lot. The delivery came exactly how they'd told us and the dinning piece is exactly what we were looking for. Love the look of this table. Good quality! Always happy with Raymour’s products. After reading the reviews I bought a table protector to keep the table looking as beautiful as it does. I have received a lot of compliments. This was the perfect kitchen table set for us. Great size with the option of the internal leaf in the middle. I really like the ability to expand it if necessary. Be warned that the leaf sitting inside is noticeable in leg room but that is not enough for me to knock off a star. BEST ANSWER: This question would best be answered by our customer care department. Please call our customer care department at 866-383-4484 option 2. How many people can the set sit comfortably with the leaf in? BEST ANSWER: Including the leaf, the table will seat six people comfortably. Six people can sit comfortably when leaf is in. WHY ISNT THE KENTON 5 PIECE DINING SET IN EBONY AND BLACK NOT THE SAME PRICE AS THE BUTTERMILK ONE? BEST ANSWER: We have a special currently running on the Kenton II collection, which is the buttermilk color. Most likely this is because we have extra inventory on this color of the set. I apologize if this causes any inconvenience. Who is the manufacturer for the Kenton 5 piece dining set? BEST ANSWER: The manufacturer of the Kenton is Bellanest, which is Raymour & Flanigan's exclusive brand. The Kenton Dining Set is made in Malaysia. Following a live chat, I found and opened the latches under the table, but still don't know how to manipulate the leaf to store it. Can someone help? BEST ANSWER: If you lift from below the leaf, they will "fold" into the table for self-storage. Set was delivered today with leaf already in table. How do I operate the leaf to get it back to a round table? BEST ANSWER: The Kenton features a hinged, self-storing "butterfly" style leaf. Simply pull the table top apart, fold the 2 halves of the leaf underneath, and push the table top back together. BEST ANSWER: Yes, it is made with kiln-dried hardwood and furniture-grade plywood frame materials with hardwood veneers. What size rug did you use under the table? BEST ANSWER: It would be recommended to use a 5" X 8' rug or larger. what is the color of the tabletop? BEST ANSWER: The table top is dark walnut. Is the table available without the chairs? BEST ANSWER: The Kenton table is available as an individual purchase without the chairs. The SKU # is 796042150. Hat is the Weight capacity for the chairs? There is not a specific weight limit on the chairs, but a good guideline is approximately 250 lbs. how to adjust the height of this table? BEST ANSWER: Part of the center of the base is removable to adjust the height of the table. Does this table have a leaf in the center? BEST ANSWER: The table does have a leaf in the center. The length is 42" L without the leaf and 57" L with the leaf. Do the chairs have scratch protectors on the legs? BEST ANSWER: The chairs have plastic stoppers on the bottom of the legs to prevent them from scratching the floor. Do the chairs have reddish marks on them? BEST ANSWER: No, the chairs are black with a cherry stained seat. They are very nice, built well, and look exactly like the picture. Yes they do. It appears that is a "bleed through" type of effect I believe. Not a defect. I would like to know how the surface is with hot and cold items? I currently have a wood table which I can't even put a glass of cold tea on it because it leave a ring. BEST ANSWER: We have had this table for three years and have never gotten a ring when putting hot or cold drinks on it. It's built very well and cleans up nicely. I would highly recommend. The table has been forgiving with glasses, though mostly we try to use place mats for plates & serving dishes. can i get this set with armed chairs? BEST ANSWER: Although the Kenton collection does not offer arm chairs, you would be able to purchase the table individually and select your choice of arm chair to configure your own combination. Are there supposed to be reddish markings on chairs? I would like to purchase the accent server pice shown with table? BEST ANSWER: The accent cabinet displayed in the room image with the Kenton dining has been discontinued. What are the dimensions of the packaging for this set when in-store pickup is selected? Tried to close this table and the extension piece hangs down. Seems to be missing a part to hold it ups. Are there instructions on how to do this? BEST ANSWER: Hello Robert, we're sorry your experiencing issues with your Kenton Dining Set! A reply has been sent directly to your personal email address. Please contact Customer Care at 866-383-4484, option 7 for additional product details. What size tablecloth would you use on this table while using the leaf? BEST ANSWER: I would recommend a table cloth that is at least 76 inches by 52 inches, which will give you an 8 inch drop. If you want a larger drop, then you will want a tablecloth that is larger than 76" by 52". Is this real wood , what type of wood . Where is it made ? ? BEST ANSWER: The Kenton Dining Set is made with real wood. The dining set is crafted with kiln-dried hardwood and furniture-grade plywood frame materials with hardwood veneers. The Kenton is manufactured in Malaysia. Can you get seat cushions to fit for the chairs? BEST ANSWER: Raymour & Flanigan does not offer seat cushions for the Kenton Chairs. Is there a table pad or glass top that can be puchased for this table? BEST ANSWER: Although there is not a table pad or glass top specific to the Kenton collection, a table pad can be special ordered from your local Raymour & Flanigan showroom. why isn't the server available anymore, I have the table and would love to buy the server? BEST ANSWER: The size of the rug shown is approximately 8' X 10'. Although this exact rug is no longer available, you will find similar rugs by entering the name Jaipur in the web site's search box. what is the maximum weight capacity for the chairs? Does this product come in buttermilk/autumn or autumn/autumn? BEST ANSWER: The Kenton Set is available in two finishes, the ebony and dark walnut and buttermilk and dark walnut. does delivery include take away of all cardboard and wrapping? BEST ANSWER: Raymour & Flanigan provides a White Glove Delivery service. Delivery includes all necessary assembly and a comprehensive quality inspection of your furniture prior to it being delivered to your home. Some pieces may require final assembly in your home due to their size or configuration. Our delivery teams will remove any packaging before leaving your home. What colors died this dinette come in? BEST ANSWER: The Kenton 5-pc. Dining Set is available in Ebony/Dark Walnut or Buttermilk/Dark Walnut.